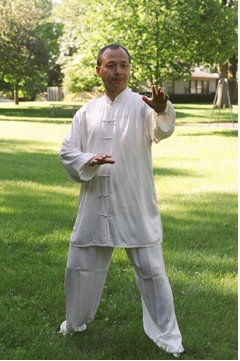 Why Standing Meditation – Yang Yang | Learn Qigong Online @ Discover The Fire! Why do we do standing meditation (standing wuji)? This is one of the most frequently asked questions, and it comes both from beginners as well as long time Taiji form practitioners. Standing meditation is strength training to your legs while you bend your knees and flex your hip joints slightly (i.e. sink into the “kua”). It is strength training to your arms while you hold your arms at different positions. (Note that during training, you should change the position of the arms. You should not attempt to push past your limit in holding your arms extended, nor should you quit at the first sign of discomfort. Rather, learn to relax into the posture. Lower or change your arm position when you fell necessary, and raise them again when you feel comfortable to do so). Very importantly, standing meditation is core strength training; the muscles of the core are constantly engaged to maintain correct posture during standing meditation. The core strength training is intensified when the arms are held extended in front of the body – the bodies’ response to counter the forward shift in the center of mass and maintain “central equilibrium” is to contract core musculature. Indeed, if the core musculature is not engaged you would fall forward when extending the arms. Building, and learning to use, core strength (i.e. internal), instead of muscle contraction from the limbs/extremities (i.e. “external”), is an integral mechanism of internal martial power, and standing meditation is where this is first learned.